Out of the diets out there in the world, the one that consistently shows up as one of the healthiest and most effective for longevity is the Mediterranean diet. The Mediterranean diet provides a good amount of healthy fats through oils like olive oil, as well as omega-3’s through fish oil. If you consider the great amount of vitamins and minerals provided through fresh fruits and vegetables, you will quickly understand why they are at the core of the Mediterranean pyramid. As stated by the Mayoclinic, “Residents of Greece average six or more servings a day of antioxidant-rich fruits and vegetables. Grains in the Mediterranean region are typically whole grain and usually contain very few unhealthy trans fats. Also bread is an important part of the diet. However, throughout the Mediterranean region, bread is eaten plain or dipped in olive oil — not eaten with butter or margarine, which contains saturated or trans fats.” Anytime you have the ability to add a new variety of fruits and vegetables, your body will recognize the difference right away. 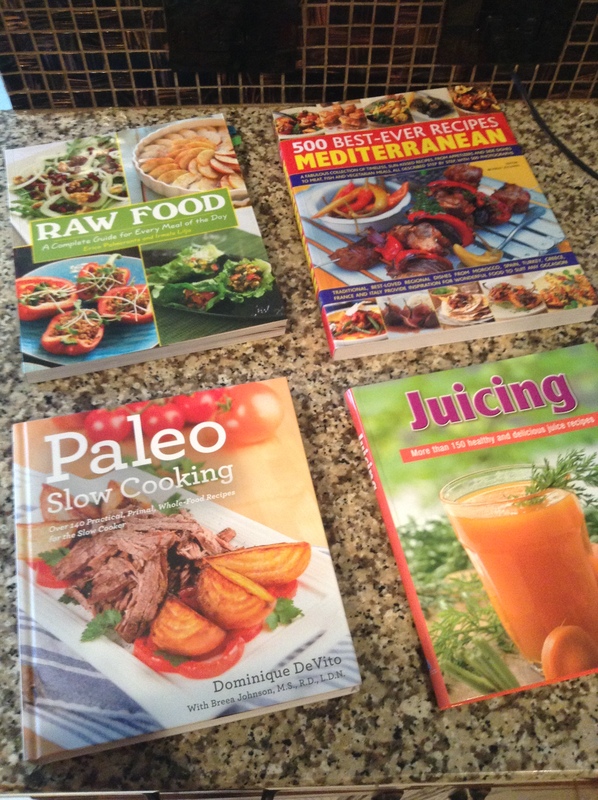 Ever since I dived deep into the study of nutrition, I read a book called Low-Fat Lies in my nutrition class. Unsurprisingly they recommend the Mediterranean diet, because of the importance of monounsaturated fats and polyunsaturated fats. When you include healthy fats in your diet, they will help with your cardiovascular health and aid in the ability to fend off disease. There you have it, if preventing disease and maintaining good health are not goals of yours I have to question, why not? If you do your research you will find that diets like the Mediterranean diet and the Paleo diet hold similar nutritional values. The major step of both diets includes cutting out typical processed American foods. 2 Medium aubergines (eggplants) cut the stalks off. Bring a large saucepan of lightly salted water to a boil. Add the two aubergines and cook for 5 minutes. Remove the aubergines with a slotted spoon and set aside. Add diced potatoes to a pot and boil for 15 minutes or until cooked. Cut the aubergines in half lengthwise and scoop out the flesh, leave about a 1/4 inch of the shell intact. Select a baking dish that will hold the aubergine shells snugly in a single layer. Brush it lightly with oil. Put the shells in the dish and chop the aubergine flesh. Set the chopped pieces aside. Heat coconut oil in a frying pan, add the onion and cook gently, stir the onion until soft. Add chopped aubergine flesh and the garlic. Cook, stir frequently for 6-8 minutes. Put the fried onion, garlic, and aubergine into a bowl and set aside. Drain and mash the potatoes. Add the aubergine mixture with the spices and almond milk. Add 1 tbsp of Parmesan to the aubergine mixture. Add salt and pepper to your personal touch. Spoon the mixture into the aubergine shells. Sprinkle the coconut flour over the aubergine mixture. 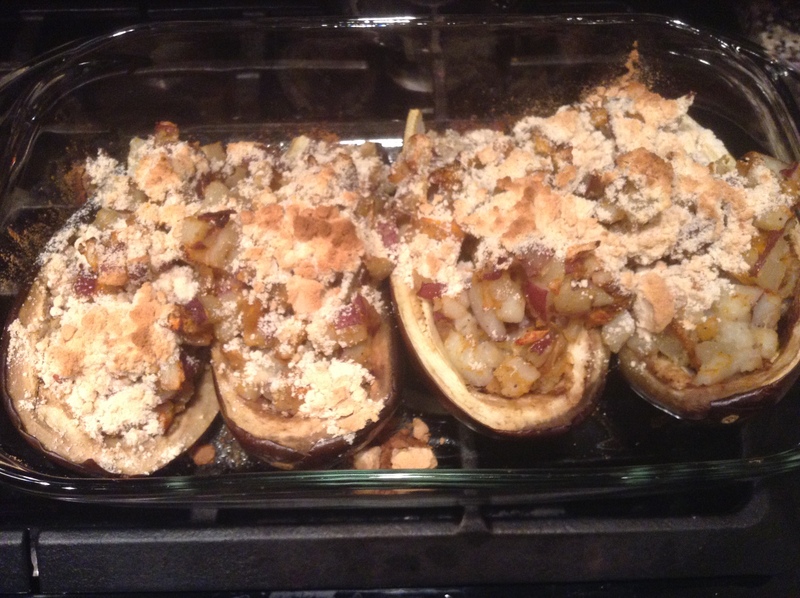 Bake the aubergines in the oven for 30-40 minutes, or until the topping is crispy. Prepare an herbal salad and add some fresh mints for extra flavor. Enjoy your lunch or dinner! 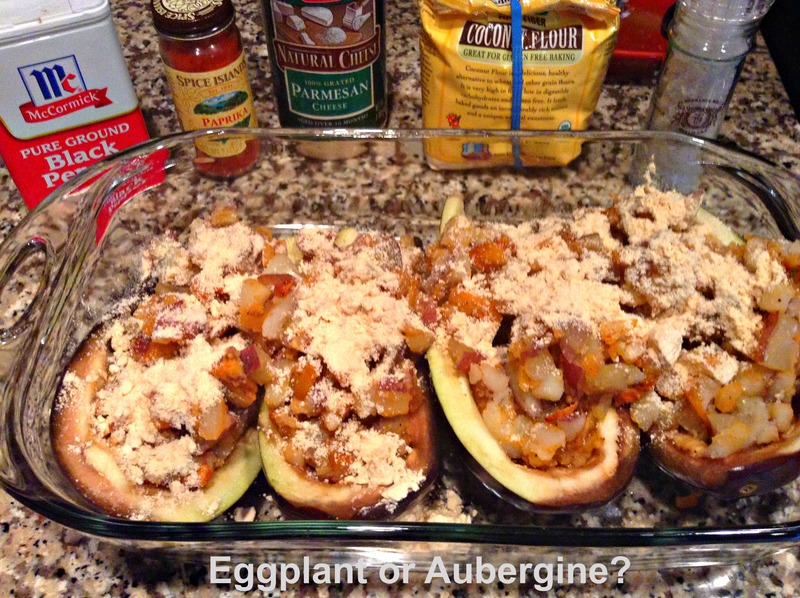 Stuffed Aubergine Energy Value: 88kcal/369kj; Protein 3.3 grams; Carbohydrate 11.2 grams. For Information on calculating Kcalories.